Top floor northeast corner loft at the Manhattan…Best loft view in the city! 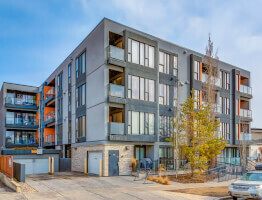 This unit has it all; steel beams, exposed timber, large windows & raw concrete ceilings. Open living in a historic building, constructed to house the Pryce Jones Department Store and once occupied by Military District #13 during World War II; featuring maple cabinetry kitchen alongside stainless steel open shelving, concrete flooring & Stainless Steel/Black appliances including a Euroflair Frigidaire Refrigerator, DCS Gas Stove & Bosch Dishwasher. The living room is raised to add storage & capitalize on the view of the DOWNTOWN skyline beyond. The lofted area boasts two bedrooms, including the master that has a large walk in closet with laundry and a 3 piece ensuite. Also note two skylights, underground parking, storage locker, main floor 3 piece bathroom & contemporary built-ins. 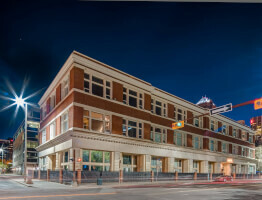 Situated in Victoria Park, Calgary's original warehouse district, filled with exciting shops, cafes, restaurants & culture.